I’ve read all Jim Collins’ books, and I’ve loved them all. They’re packed with penetrating insights and they stimulate good ideas. His books are excellent. 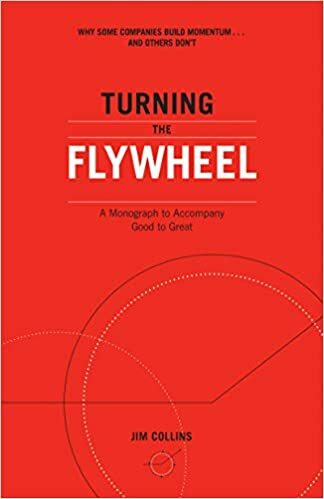 Turning the Flywheel: A Monograph to A Company Good to Great is not a book. It’s a monograph, which is a fancy way to say booklet. It’s also not very good. I thought the flywheel example in Collins’ book, Good to Great, was both insightful and helpful. It added dynamics to Richard Foster’s insights using the S-curve to describe how organizations and projects develop. Collins begins the booklet by telling you what he wants to accomplish. A little later, he says “The big thing, is your underlying flywheel architecture properly conceived?” At that point, you would expect him to start describing how one goes about properly conceiving a flywheel. That doesn’t happen. Instead, Collins describes the flywheel as the way to develop a concept. But wait, just a little later, flywheels are business models. Collins says, “Every large organization will eventually have multiple sub-flywheels spinning about, each with its own nuance.” He lists a whole bunch of companies, most of whom have never heard of the flywheel, as doing product extensions that illustrate what your flywheel can do for you. I found the booklet confusing and self-contradictory. It seemed like an ad for every book that Collins has written. Toward the end of the book, Collins says this, “I wrote this monograph to share practical insights about the flywheel principle.” I didn’t get those. Jim Collins writes great business books. He filled his books with clever analogies and penetrating insights. They’re all worth the price. This booklet is not. I don’t think authors should read their own work unless they’re good at reading aloud. Collins is a good example of why authors should think twice before reading their work. He has several verbal tics, such as the tendency to end a sentence with a rising inflection, as if he was asking a question. The tic that jarred me the most was that he pronounces the word “component” with an accent on the first syllable. It occurs dozens of times in the book, and it jarred me every time. You can check out some of my highlights and notes from this book on my GoodReads page.